Memorial Day is around the corner – a day for honoring American veterans and doing our patriotic duties. Started three years after the Civil war ended in 1868, it was the chosen day to place flowers at the graves of those who died in the war. Originally called Decoration Day, it is believed that May 30th was chosen because flowers would be in bloom all over the country. Only in 1971 did Congress nominate the last Monday in May to be recognized as Memorial Day, and expand the honor to all soldiers who died in American wars. Flags & wreaths at tombstones in Arlington National Cemetery on Memorial Day 2011. 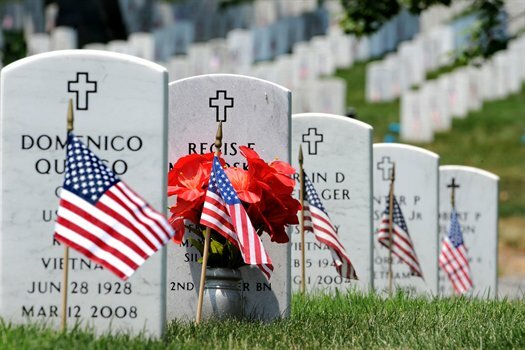 The first Memorial Day ceremony was held at Arlington National Cemetery and small American flags were placed at each grave. This tradition continues to date and has been adopted elsewhere too. You can read more information on the U.S. Department of Veterans website. It is also the day for parades, picnics and barbecues with family and friends, shopping, and the opening of pool season. This week’s recipe can be used through the year. Easy and adaptable, it can be made on the cheap too. 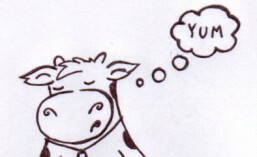 (Have you seen the price of Ice-Cream cakes at your local store?!?!) Birthday parties, graduations, family gatherings, sleepovers, play dates …… I must warn you that the never ending stream of kids through your door over the next few warm months will love visiting you. Plus the fact that you can make it a week ahead of your event and freeze it makes it even more divine. 1) Line the bottom and sides of your 9-inch pan with a double layer of plastic wrap so that the edges come over the sides of the pan. 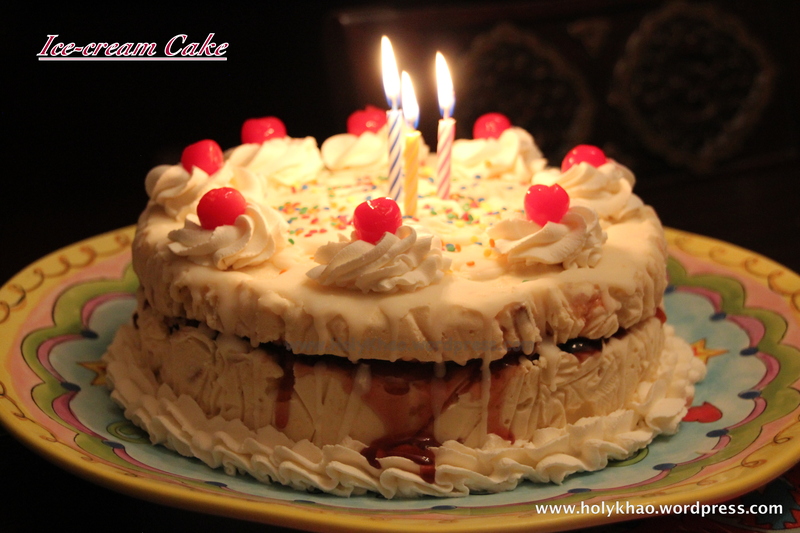 2) Place one round cake in the center and poke holes over the top using a chopstick or fork. 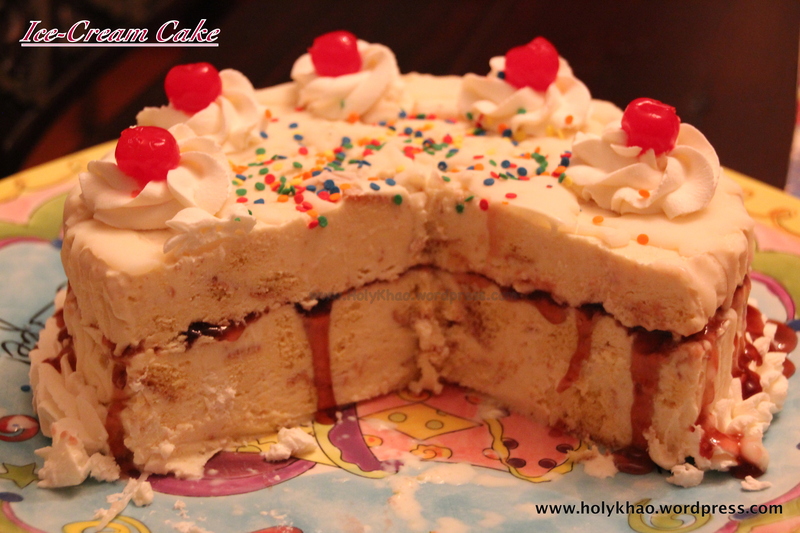 3) Pour half the softened ice-cream on top and over the sides of the cake and smoothen to make it level. (If you like jam or berry sauce, pour on the cake first before adding ice cream). 4) Arrange a single layer of sliced fruit or crushed cookies on top (if using). 5) Gently drape the wrap over the ice cream (or cover with a freezer safe plate) and freeze for about 2 hours. 6) Remove pan from freezer and unwrap. Place the other round cake over the first layer and poke holes again. 7) Pour the remaining ice-cream on top and around the sides and smoothen again. Make sure the top is flat. 8) Gently cover again and refreeze for another 2 hours. or overnight. 9) To plate & serve: remove pan from freezer and let it sit on the counter for a few minutes. 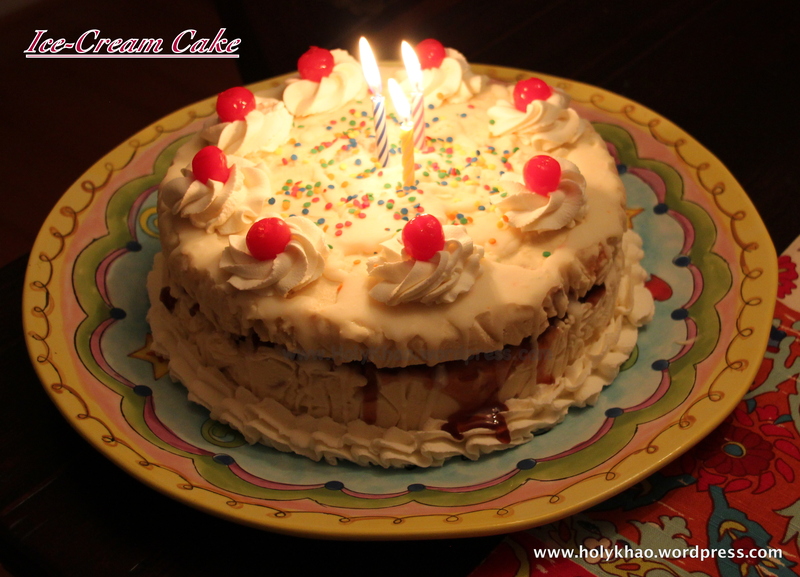 11) Decorate with Magic Shell or whipping cream and top with cherries / berries and sprinkles. TIP: For smooth and easy cutting, run or dip a knife under warm water and slice. If you have a larger crowd to serve, you can follow the same method with a rectangular 9X13 cake. Just bake the cake as per instructions and cool completely (or use store bought). Trim the edges by a 1/4 inch on all sides and gently slice across to make two 9X13 layers. 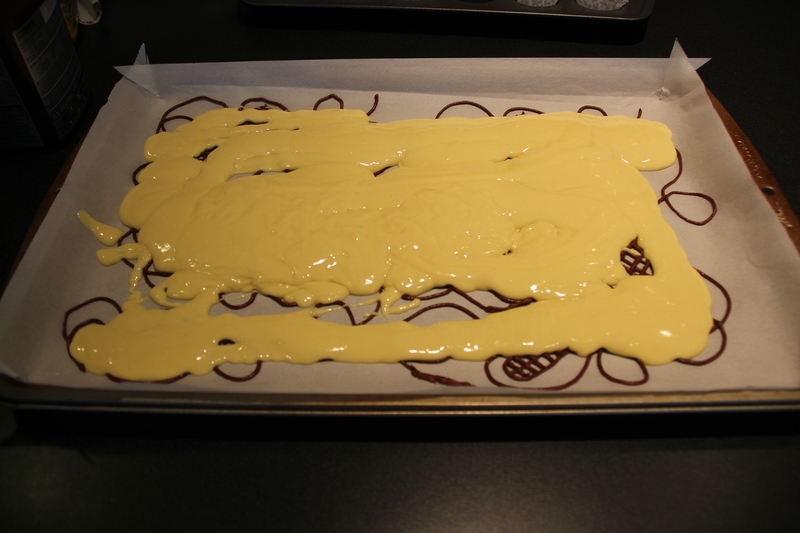 Place one sheet cake back in the same pan that is lined with a double layer of plastic wrap. Follow the remaining instructions as above. When ready to serve, cut into squares. Mother’s Day is to tomorrow. 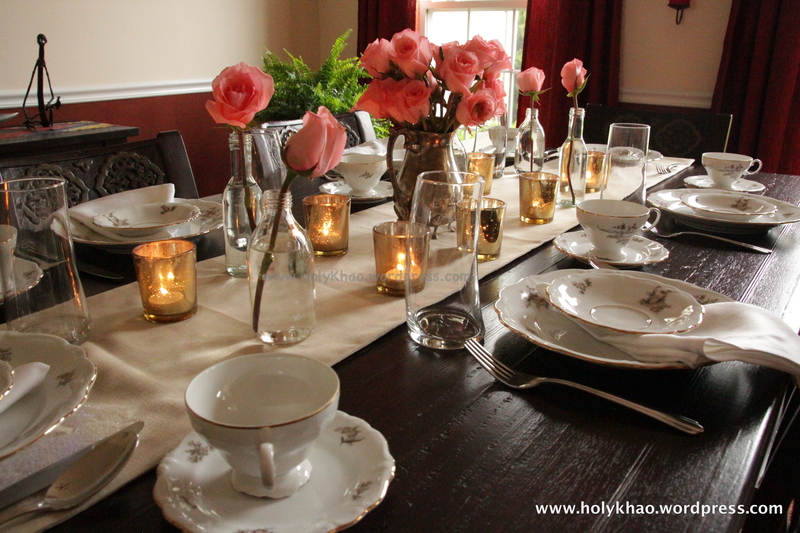 I’m sharing an easy, inexpensive and pretty table setting that dad and the kids can put together in a jiffy. Plus, mom doesn’t have to worry about her favorite collectibles chipping :)). My grandmother, mother and all my aunts are in town this weekend and my husband and kids have invited everyone to an informal backyard barbecue to celebrate Mother’s Day. I am looking forward to spending the day with 5 generations and hope to get some good photos as I won’t be in charge of cooking. STEP 1: Buy or pick flowers and set aside. 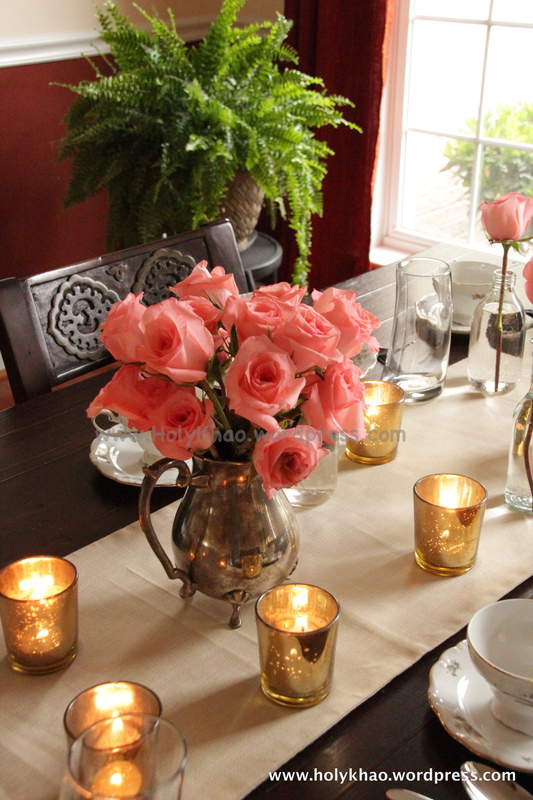 STEP 2: Spread a tablecloth or table runner (use a dupatta or scarf or even a folded bed sheet) on the dining table. 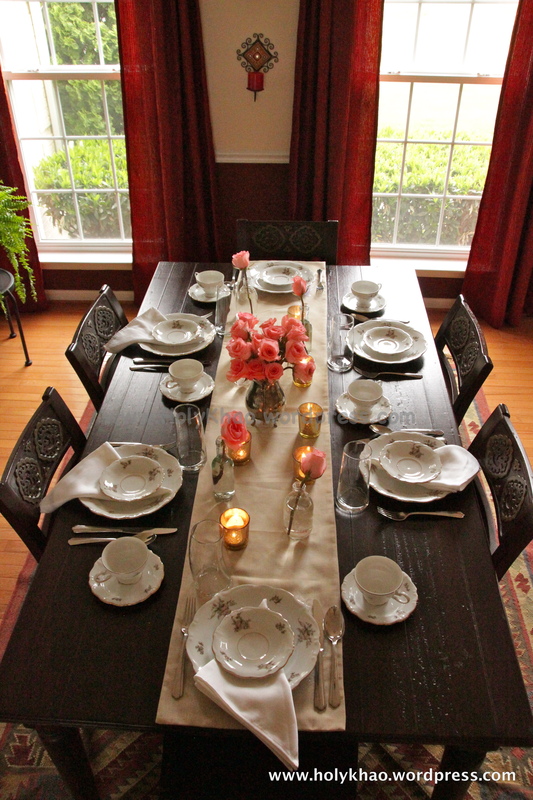 STEP 3: Set the plates, cups, napkins and flatware as needed. STEP 4: Fill empty bottles from around the house with water- different heights and sizes add interest to the table – and place cut flowers in them (I have used empty single-serve wine and soda bottles). You can use jam bottles, water bottles, or even water glasses. STEP 5: Place a few candle holders in between and use tea lights, pillar candles, or a combination of both. STEP 6: Watch mom’s face light up at the sight of the pretty presentation. 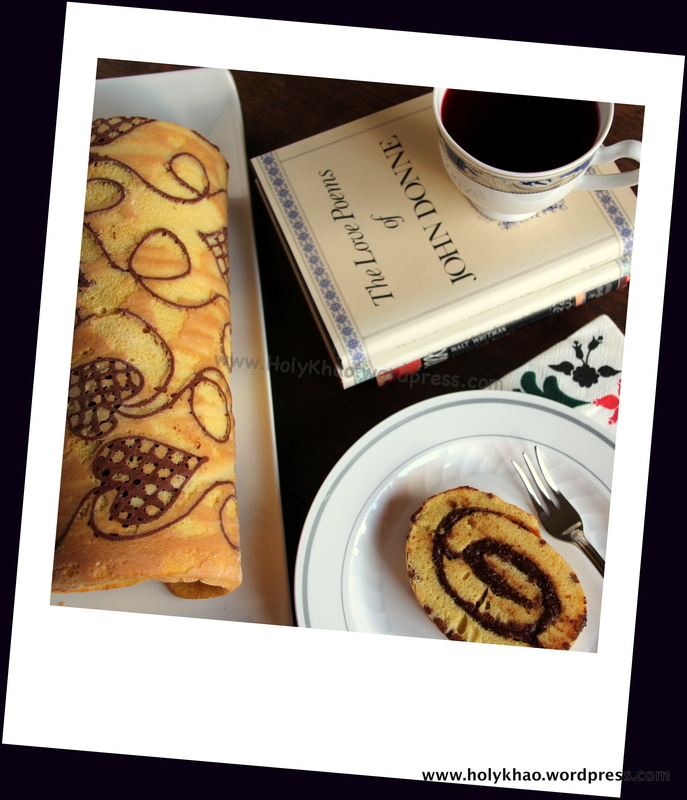 For Valentine’s Day, I’m sharing the recipe for a Patterned Jelly Roll (or Swiss Roll). 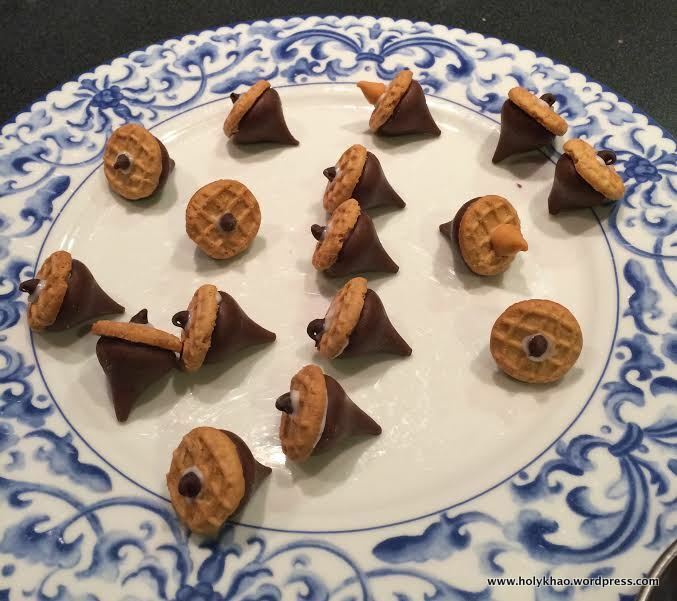 I had seen this on the Wilton website a while back, and noticed a few bloggers posting some amazing ideas. Finally got around to giving it a try and I love it. My design incorporates the hearts ubiquitous to Valentine’s Day, but with a slight desi twist 🙂 – I imagined a henna design cake for a mehendi party! 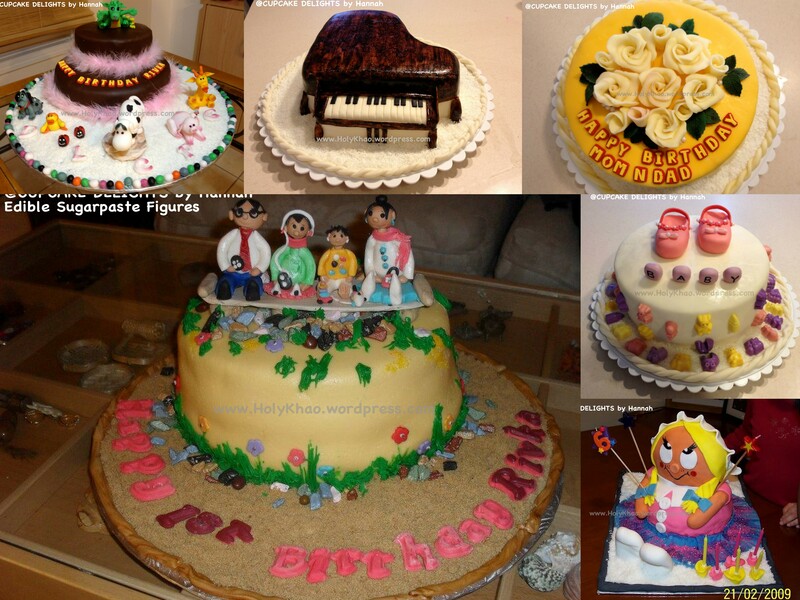 The possibilities are endless here – you could personalize the cake with names, logos, themes, characters, wishes, etc. The combinations of colors and flavors are your choice. 1) Find a pattern that you like and print or draw it onto a long 12X17 sheet of paper, or onto 2 horizontally taped letter size (8 1/2 X 11) sheets. 2) Place it on your jelly roll pan and lightly tape down at the edge, making sure that the tape overhangs and is easily reachable with your fingers. 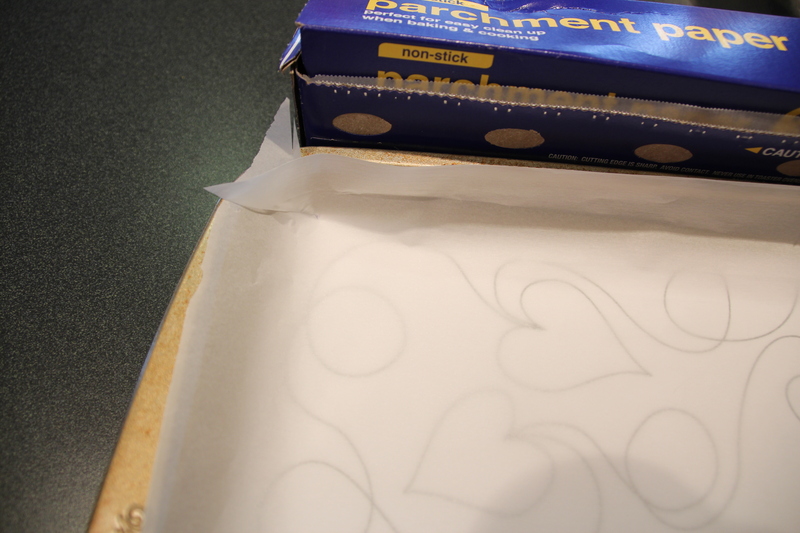 3) Place parchment paper on top of your design, making sure that it comes up the sides of the pan. If the sheet is too large, cut down to size. Gently tape down on one or two sides only if necessary. 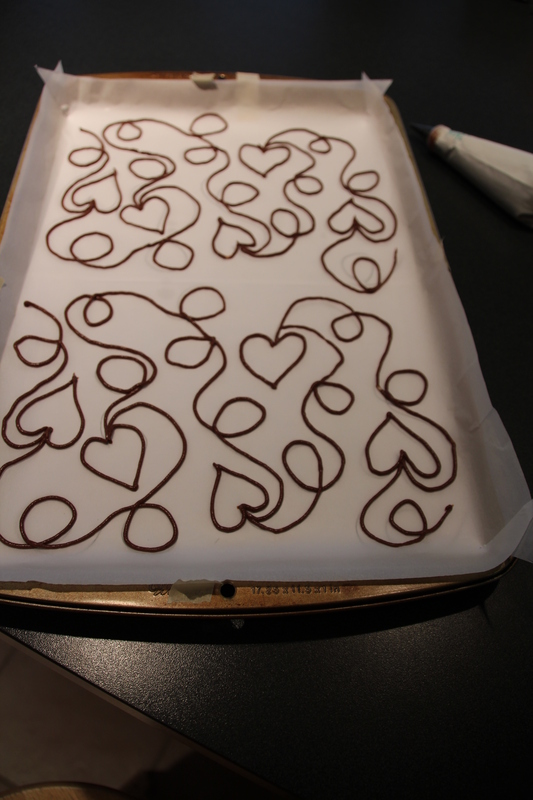 4) It helps to make a small diagonal slit at the corners of the parchment paper so that it stays in place more easily. 5) Lightly grease the parchment paper with a thin layer of butter – either ‘paint’ it on using a pastry brush OR rub a stick of butter on the paper to cover evenly. Set pan aside. 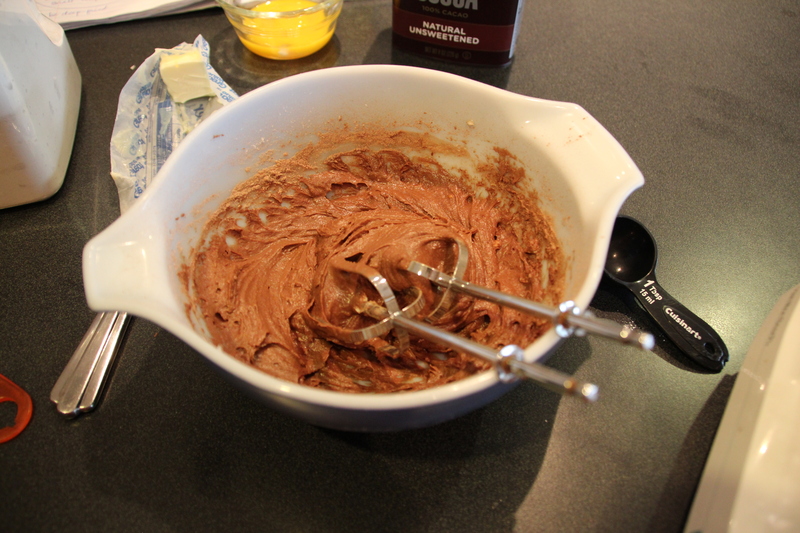 6) In a medium bowl, cream the butter and sugar together with an electric mixer till fluffy. 7) Add the egg white and beat till well incorporated. 8) Add the flour and cocoa (or food color) and gently mix till no streaks remain. 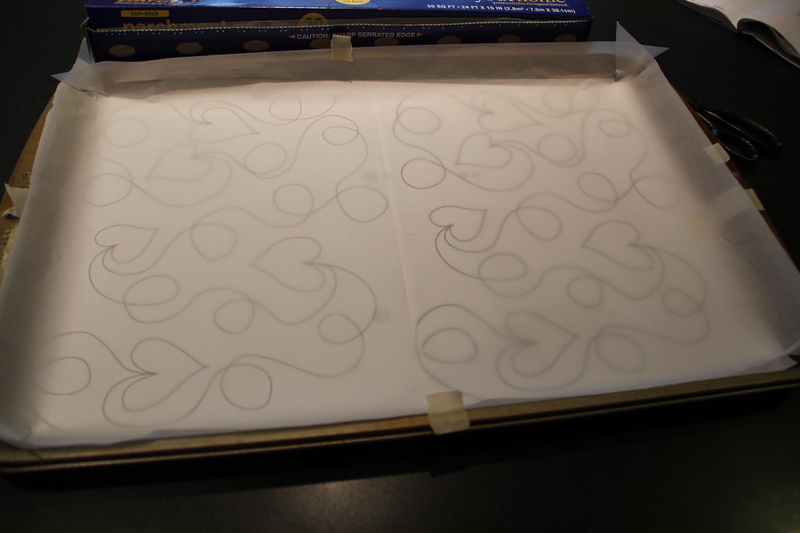 10) Carefully pipe the design on top of the parchment paper by following the pattern underneath. 11) Place the pan in the freezer for about 15-20 minutes for the design to firm up. 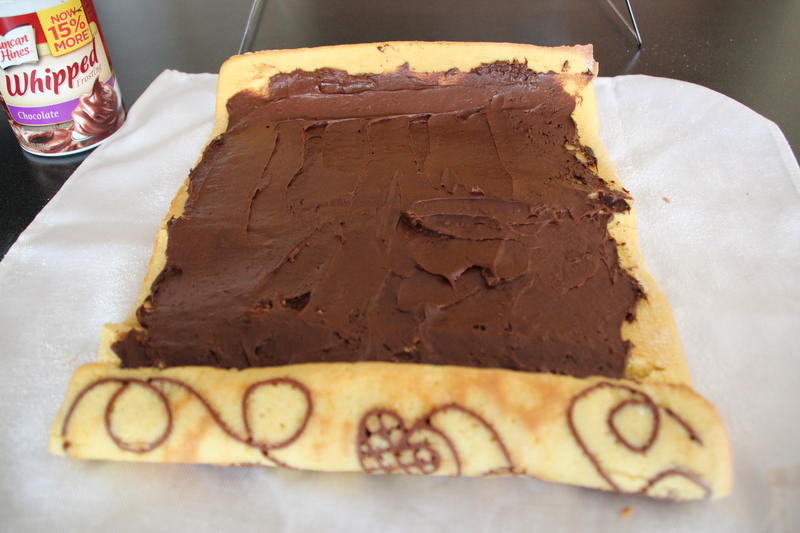 13) In a large bowl, prepare the box cake mix according to directions using the water, eggs & oil. 14) Remove pan from freezer,and gently slide out the printed paper pattern from under the parchment using the overhanging tape. 15) Gently pour 2 full cups of batter on top of the design and spread evenly all the way to the corners using a dinner knife or offset spatula. 16) Bake in center of oven for 8 minutes. 17) After 8 minutes, turn the jelly roll pan around so the rear is now in the front. This allows even cooking. Cook for another 7-8 minutes. 18) While the cake is cooking, clear the counter and get a cooling rack ready. 19) Remove cake from oven when time is up and place on cooling rack. 20) Roll the cake with the parchment paper loosely and carefully set it seam side down on rack for 2-3 hours to cool completely. Do not disturb or move it. 21) Once completely cool, unroll the cake onto a flat surface and spread frosting or whipped cream & fruit and spread evenly, leaving a half inch clearance at the edges. 22) Re-roll and serve sliced. 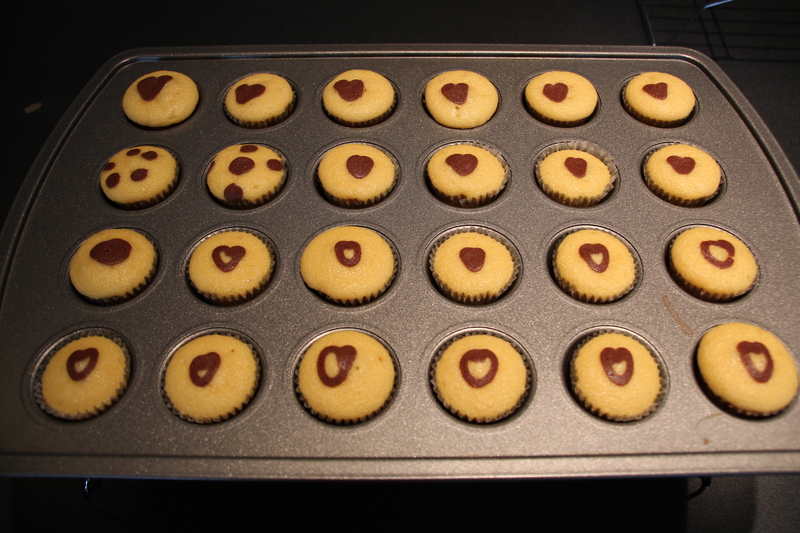 NOTE:- Meanwhile, use the rest of the batter to make cupcakes – I filled mini cupcake liners and used the remaining chocolate batter to draw little hearts on top. Bake according to instructions on the box. Last weekend, I attended a Cast Party for a dance I did at our local Indian association event. While the piece itself was small, it was so much fun going to practices, picking out outfits, and dressing up for the ‘big show’. The entire segment involved almost 70 people – men, women & kids. A lot of kids!! For many years, I had planned on making candy-melt Monarch butterflies that I had seen in a cake decorating book, but never got around to it. 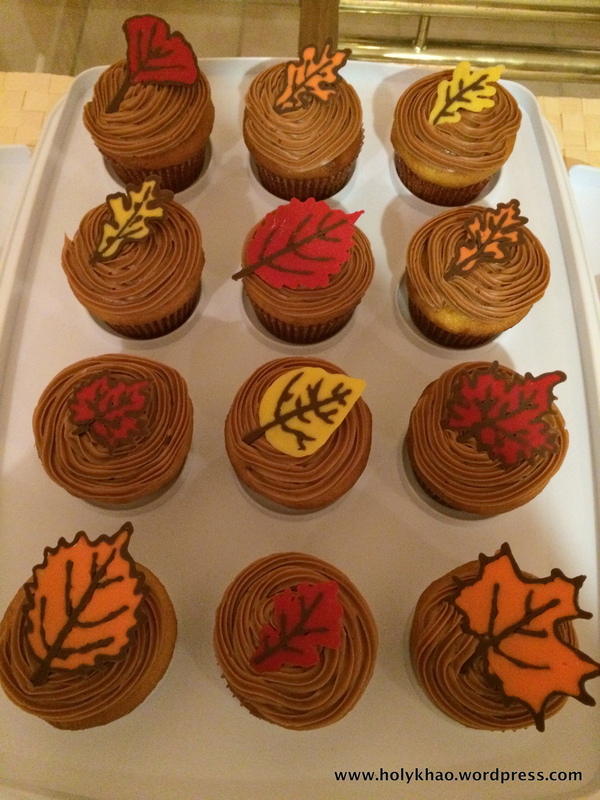 I figured it might be a good technique to use for fall cupcake decorations. Considering that there would be dozens of kids at the party, my reasoning was that no matter how the end result would be, the kids would devour them. I was pleasantly surprised at how quickly these decorations came together. 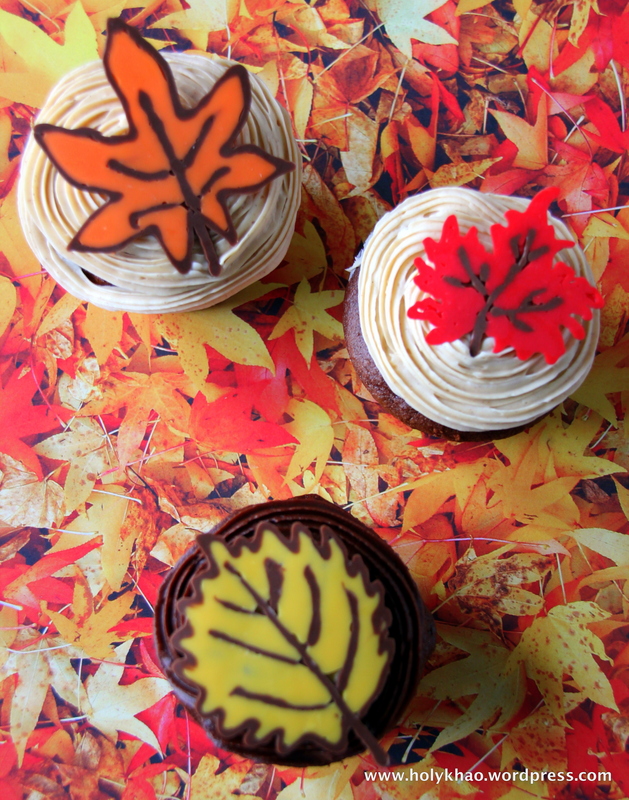 I made the candy leaves one afternoon, and baked and decorated the cupcakes the day of the event. It’s easy enough that the kids can help – my 10 year old did. Suffice to say that the first of three boxes of cupcakes was emptied out even before dinner was served! 1) Make copies or free-hand sketch the design you want onto white paper. 2) Place on a flat, moveable surface (like a cookie sheet or sturdy chopping board) and top with wax paper. Once in position, tape down into place. 3) In a small bowl, microwave a handful of Candy Melts according to package directions till completely melted and runny. 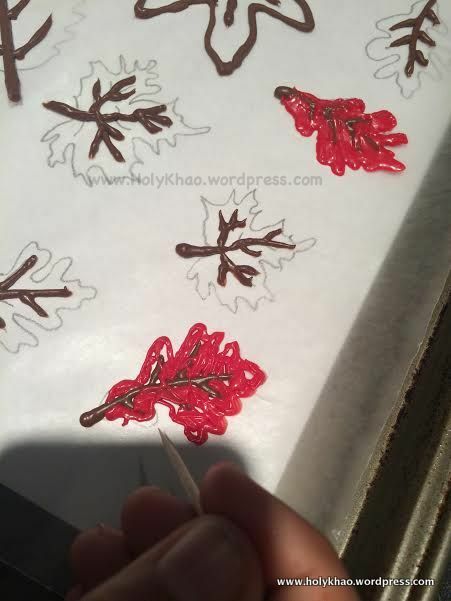 4) Pour into the piping bag / ziplock bag (make a tiny snip at the corner for the candy to flow) and using a slow and steady hand, pipe over the designs. 5) Allow to harden – about 10 minutes. As you can see in the picture above, I used a piping bag. The tray on top has the full outline piped in. The one on the bottom has only the ‘veins’ piped in. You will see below how these give two different effects. 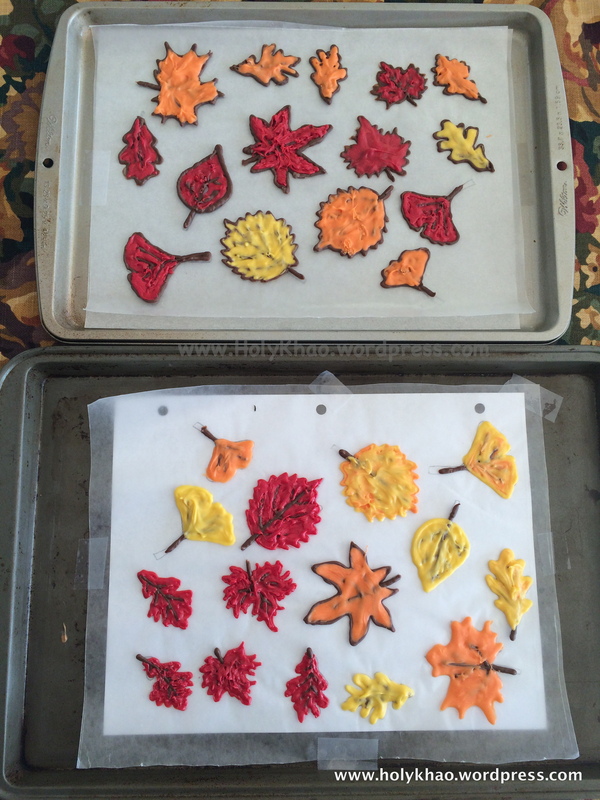 6) In another small bowl, melt a handful of leaf color candy melt chips and pour into another bag. Pipe over the leaf designs and make sure to fill in the entire design. Go over the back of the ‘veins’ and make sure that all areas are covered. 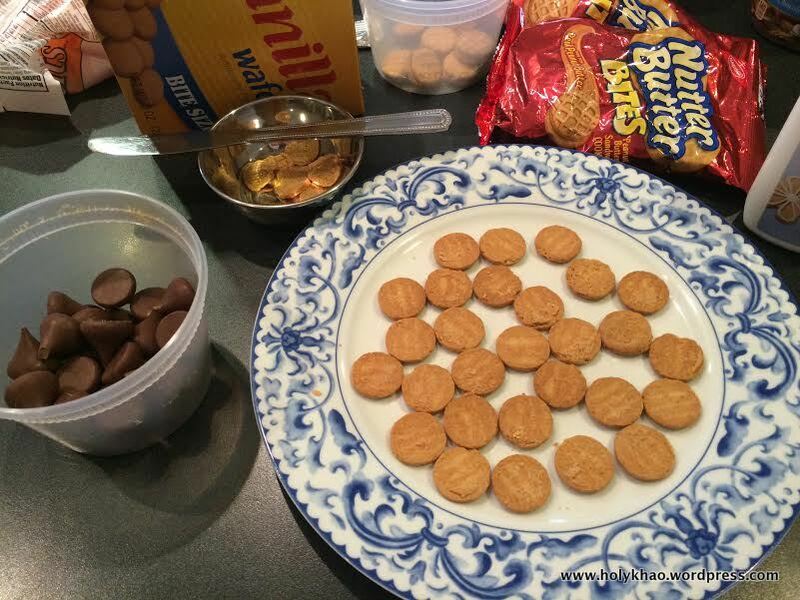 7) Set the finished cookie trays aside to harden – about 30 minutes (depending on how thick you spread the candy). Alternately, stick them in the fridge or freezer for about 10 minutes to harden up faster. 8) When set, gently slip a spatula under the candy leaf – it should slide right out – and place on top of your completely cooled and frosted cake. 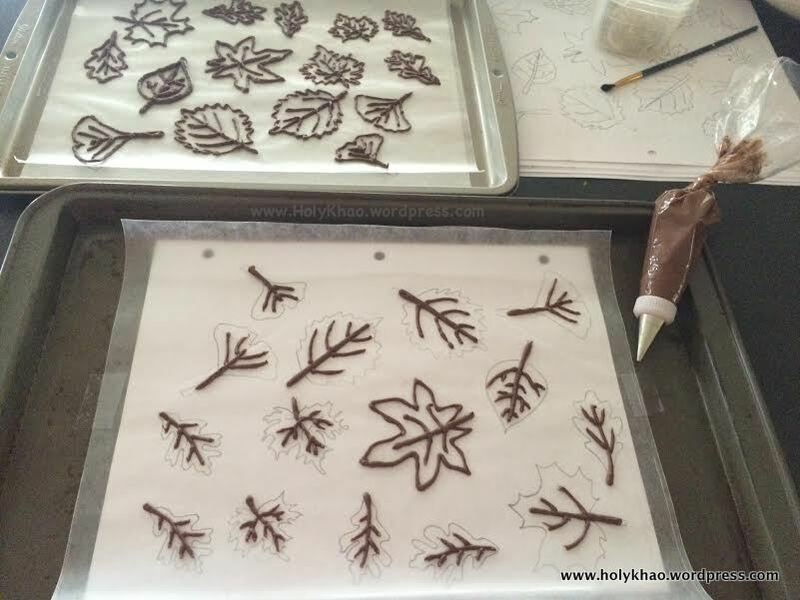 2) Melt a few Candy Melts and pour into bag for piping (or use the leftover bag from the candy leaves). Place a small dot on a few cookies. 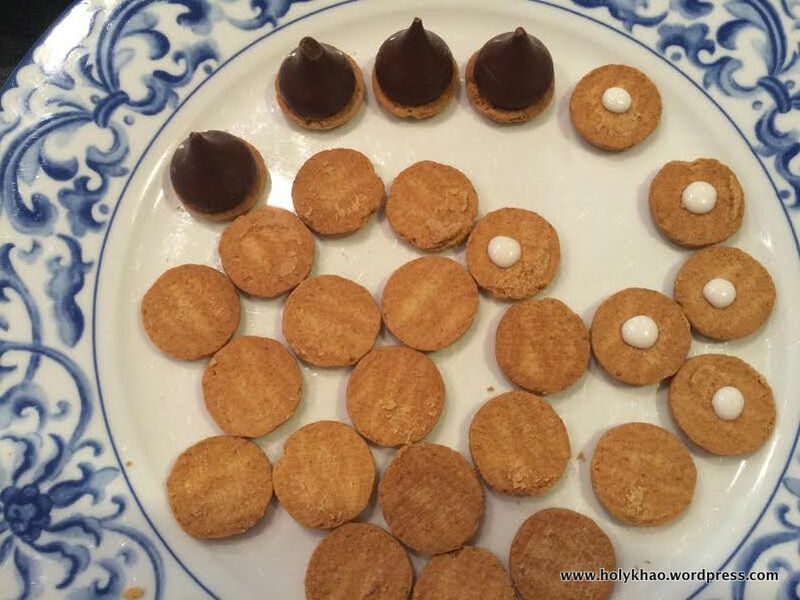 3) Quickly place the Kisses on top of the cookie and press down gently. 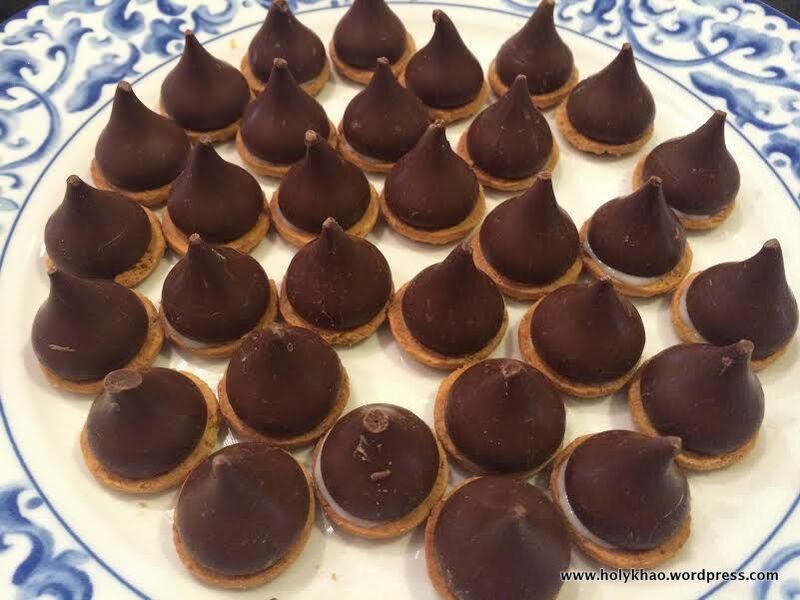 Work in small batches, and make sure the candy melts do not ooze out from under the Kisses. Do not disturb them for about 10-15 minutes, till firm. 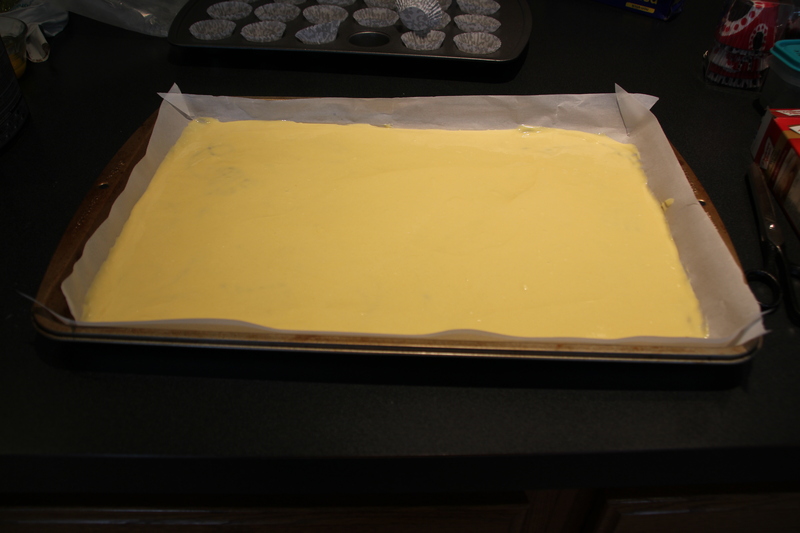 I used box cake mix & frosting – Yellow cake (my favorite! 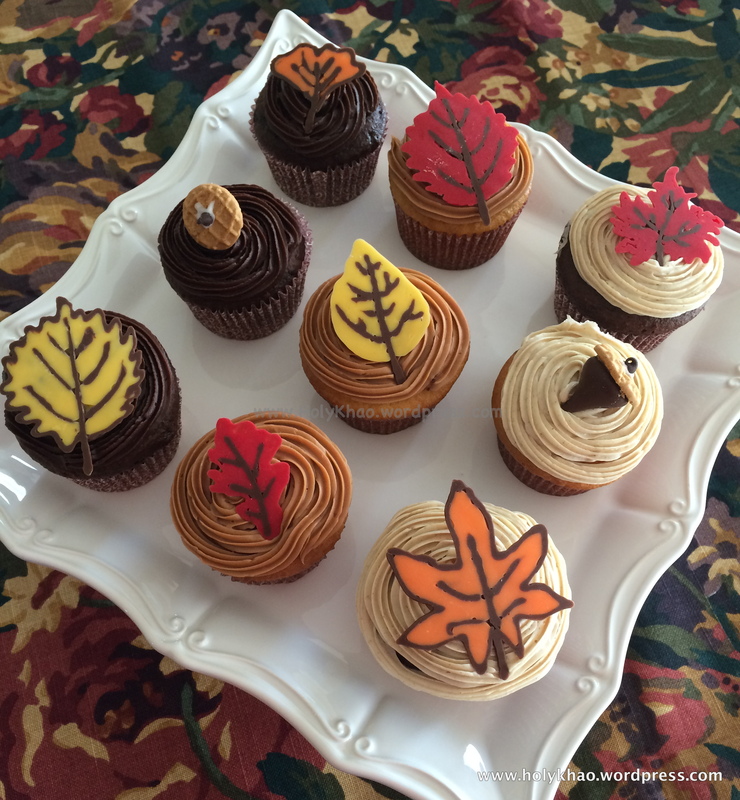 ), Devil’s Food, Caramel Apple Frosting, Cinnamon Bun frosting, and plain chocolate frosting. I made a total of 4 boxes, and about 75 cupcakes. Mother’s Day is around the corner, and I am so excited about writing my first Feature Post. I have come across many enterprising and inspiring women who balance both family and career, and are able to take the plunge to pursue their passion. This post is the first of (hopefully) many more where I can give a shout out to these wonderful ladies (and men), and spread word of their work. 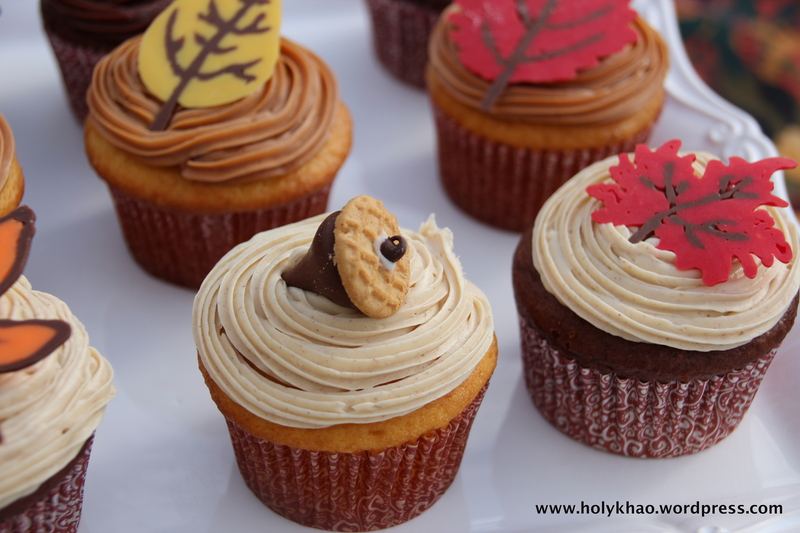 Today, I am writing about CUPCAKE DELIGHTS by Hannah Jaikumar. Hanna (and her twin sister Nandini) and I went to college together, but we had lost track of each other over the years. Thanks to Facebook, we were able to reconnect a few years ago, and catch up again. Going through her photos, I was simply amazed by her baking talent. When I found out that this mother of 2 young children works full time, and runs her baking business, I felt that I had to encourage her endeavor. I’ve shared a small sample of her beautiful creations here. Hi, I’m Hannah Jaikumar, living in Brampton, On, Canada. I am a Realtor by profession for the past 10 years, but baking/cooking has always been my passion. No matter how busy I am, I always find the time and energy to bake. HOW DID I GET INTERESTED IN BAKING…..
My cooking skills definitely are acquired from my mom Irene who is a great cook and my inspiration. I remember when I was 6-years old, my mom had baked “Vanilla Buns” during summer vacation in Delhi, India where I grew up for the first few years. The kitchen was filled with the aroma of vanilla, and the pan was a beautiful diamond shape. I still have the pan as a keepsake. The Vanilla Buns project stayed in my memory since then and eventually got me interested in baking. WHAT IS A TYPICAL DAY LIKE…. I usually measure/weigh the ingredients, and get icing bags with appropriate nozzles ready the previous night. The next morning, while the first batch is in the oven, I get the batter ready for the 2nd batch, and all the baking is done back to back. While the cakes are cooling, I get the frosting ready according to the orders placed. I prepare a basic frosting, divide it into portions, and vary the flavors with additions of extracts or fruit pulps. My family has always supported me a lot, be it tasting tirelessly by being guinea pigs or helping me in other ways. My husband Seraphim takes care of the home front, while our 11-year old daughter Rishona keeps our 3-year old Rivka entertained. Last but not the least, thanks to my twin sister Nandini who patiently listens to all my baking ideas and stories, and gives me valuable feedback. TELL US ABOUT YOUR BUSINESS…. I’ve always dreamt of starting a baking business. I started on a large scale for the first time in the spring of 2010 to raise funds for the SICK KIDS HOSPITAL in Toronto. It was the first “BAKE SALE & LEMONADE STAND” organized by my daughter Rishona. I baked 700 chocolate chip cookies in 2 days while being 5-months pregnant with our second daughter. Rishona has since continued her fundraising every year till date. Over the years I have been treating family, friends, neighbors, my daughter’s school teachers, doctors office, school custodian, school bus operator, grocery store employees, and my hair dresser to name a few. 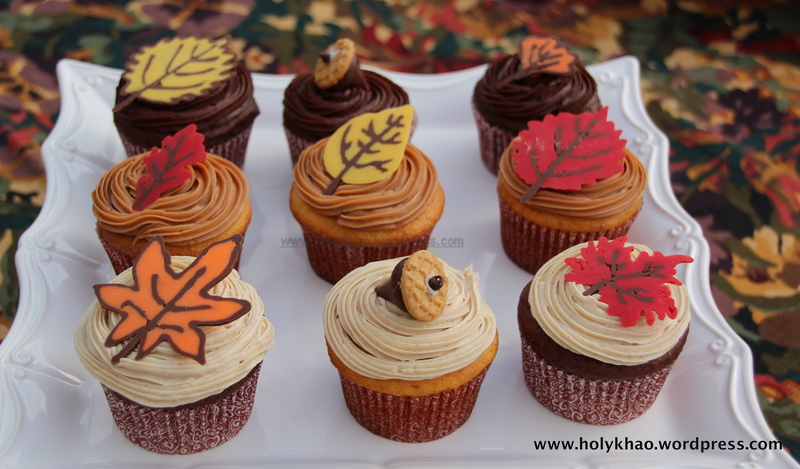 Currently, I take orders for CUPCAKES where the flavors & frosting can be customized to suit the customer’s taste. My other speciality is over 25 custom made flavors of BISCOTTI. I live about 50 kms from Toronto and cater to orders from in and around the city. All orders are to be picked up. 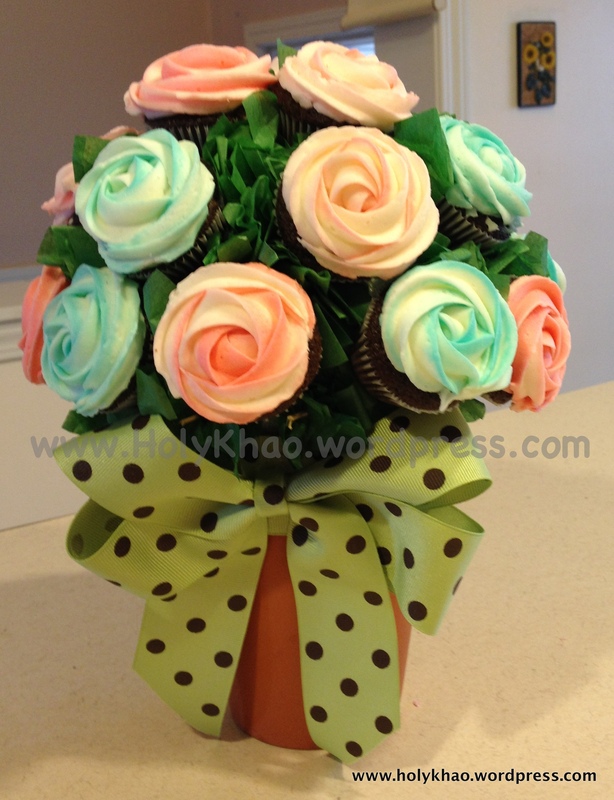 A cupcake bouquet would be a lovely gift for any occasion – Birthday, Anniversary, Mother’s/Father’s/Grandparent’s Day, Thanksgiving, Christmas, Baby / Bridal shower, Thank You, Congratulations, etc. With Mother’s Day just around the corner, this might be the sweetest homemade gift that mom ever received. 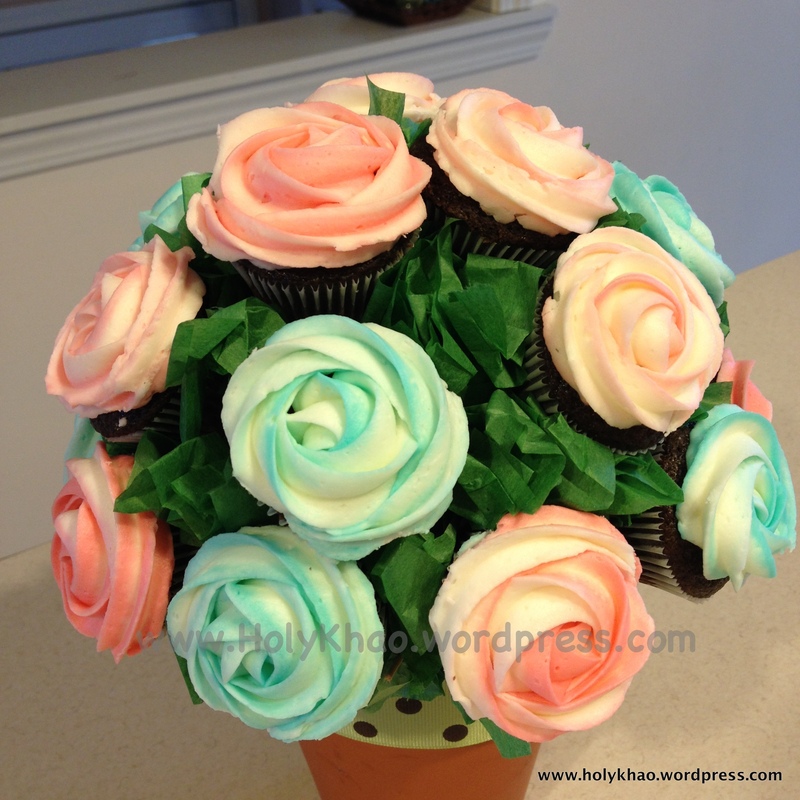 Hannah Jaikumar from CUPCAKE DELIGHTS by Hannah was kind enough to share her method for these beautiful arrangements. 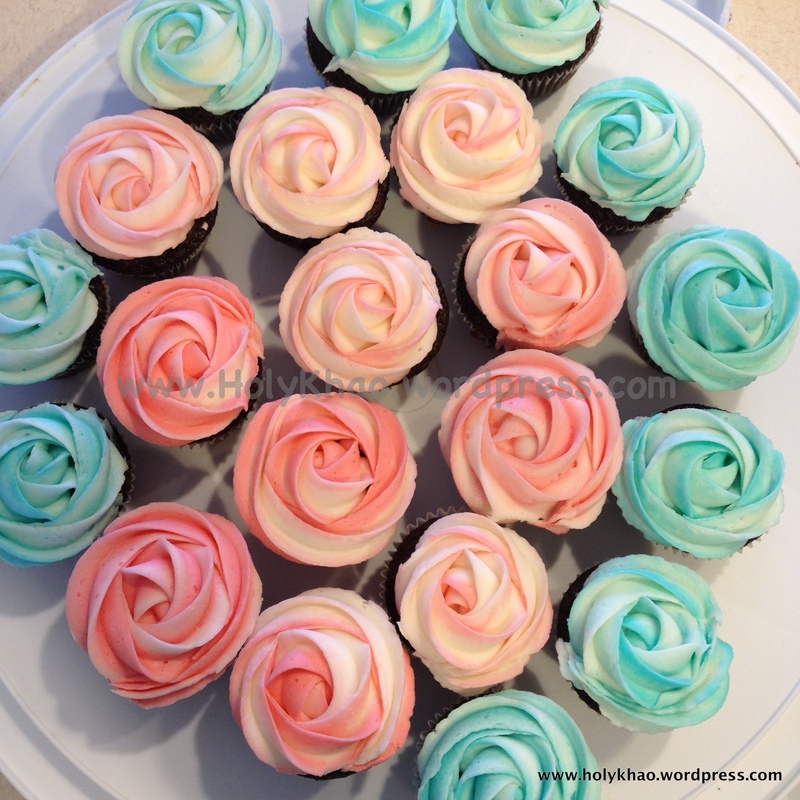 1) Bake, cool and ice your cupcakes according to the flower of your choice, e.g. Roses or hydrangeas. 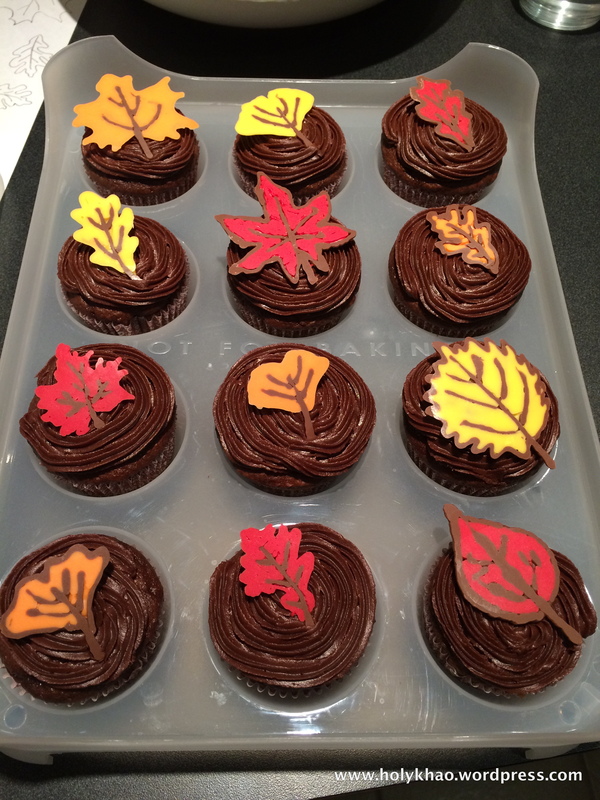 Alternately, you can use store bought cupcakes. 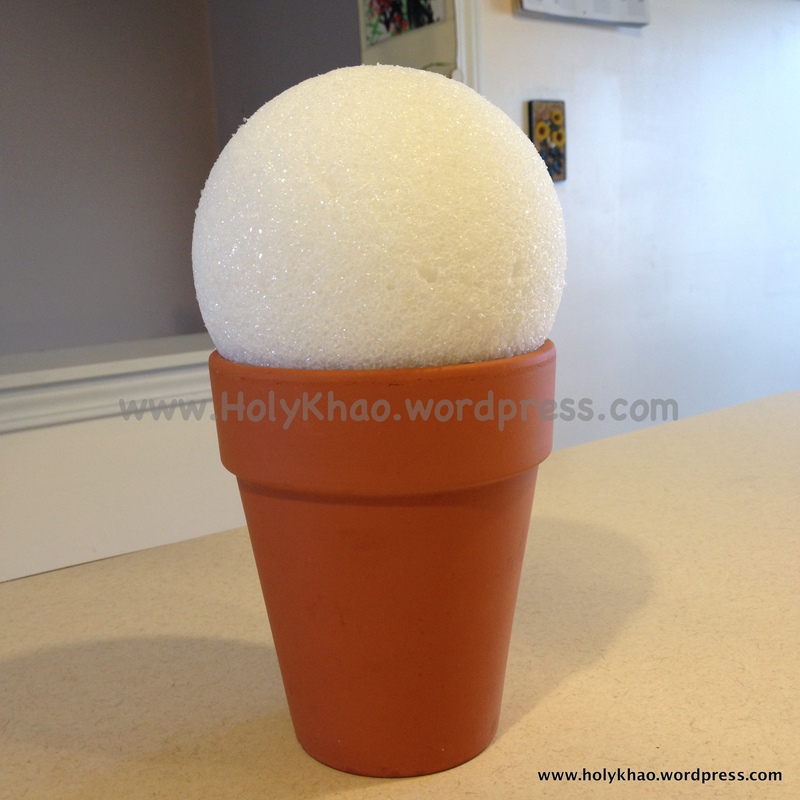 2) Fill the pot/vase with pebbles to weigh the container down. 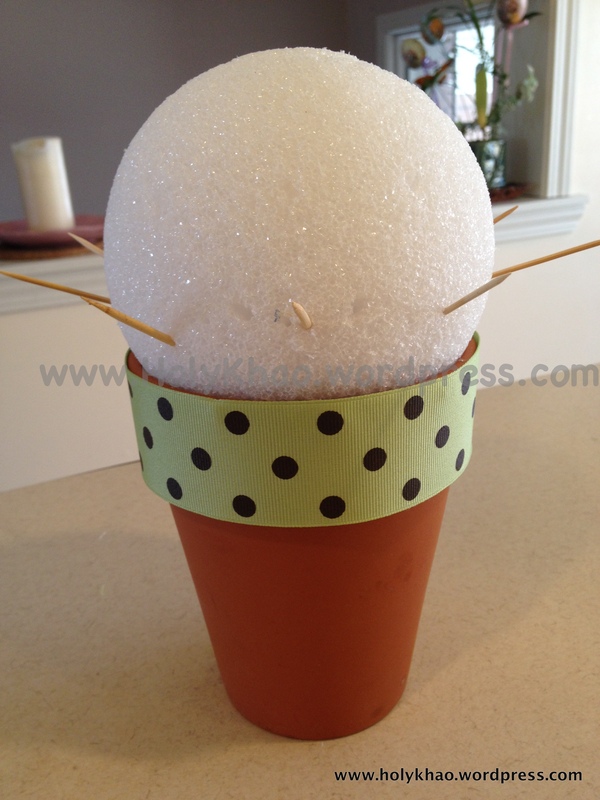 3) Glue the Styrofoam ball with hot glue to hold it firmly in place. 4) Wrap the ribbon around the edge of the pot and glue at the joining. Glue the already made bow on to the front of the pot. 5) Keeping the bow as the front of the arrangement, insert 2 toothpicks, about 1-inch apart per cupcake. 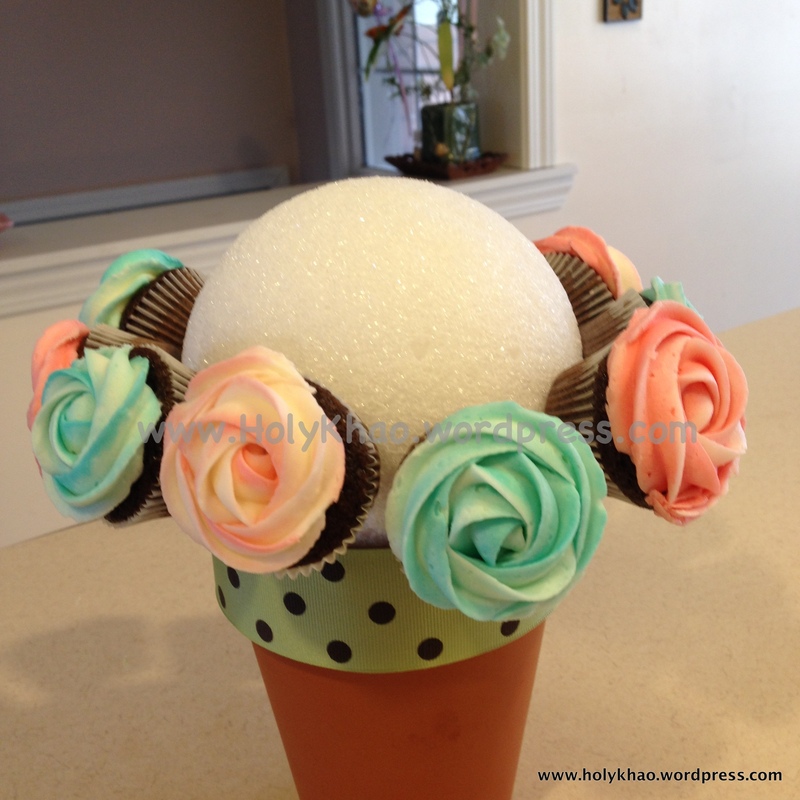 Make sure it is at a 45 degree angle, otherwise the icing will fall off or the cupcake will loosen from the paper cup. 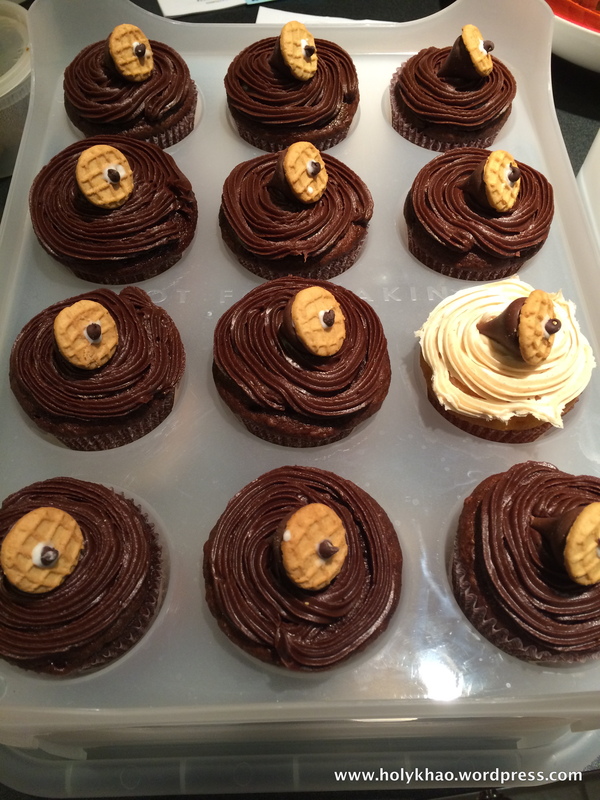 6) Place a cupcake snuggly on to the tooth picks, right in the centre. Continue by positioning 2 toothpicks per cupcake until the bottom row is complete. Adjust the tooth picks to ensure that the cupcakes are close to each other. 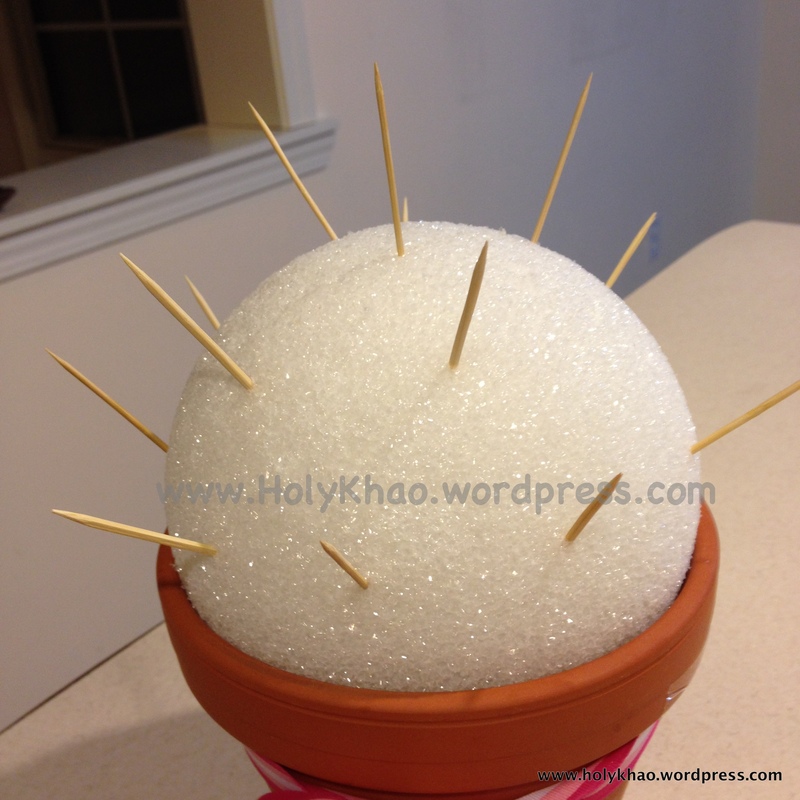 You might have to remove and re- insert the toothpicks a few times. 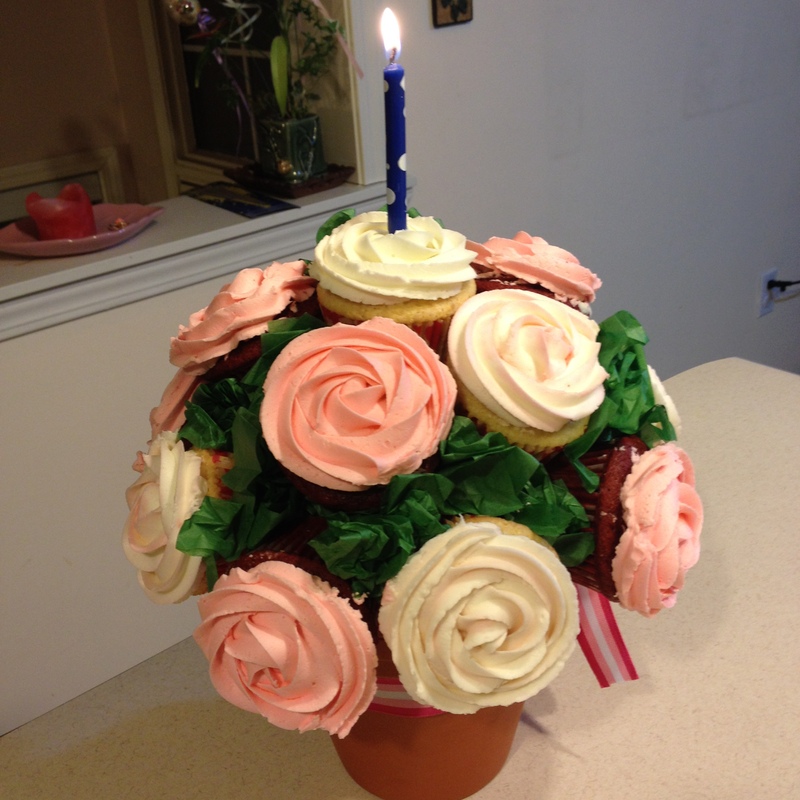 You can fit about 8 to 10 large cupcakes in the bottom row for a 6-inch pot and 6-inch Styrofoam ball. Move on to the next row with the same 2 toothpicks per cupcake pattern. The middle row will hold about 4-6 large cupcakes. The top will hold 1 large cupcake. 7) If using tissue paper, cut 1-inch by 6-inch strips. Fold the strips in accordion style. Carefully insert tissue paper in-between cupcakes, making sure not to touch or smudge the icing. Another easy trick is to use a pair of forceps/tweezers to insert the tissue paper. 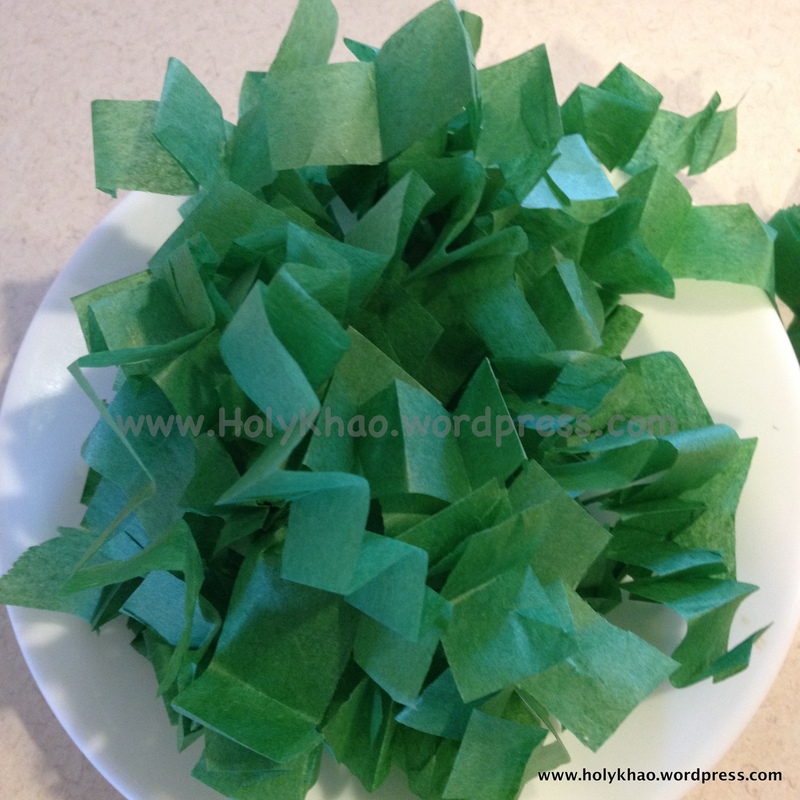 If using edible leaves follow the same procedure. Cover as much as you can so that no white Styrofoam ball is seen from the outside. 8) Cut a large size cellophane wrap. 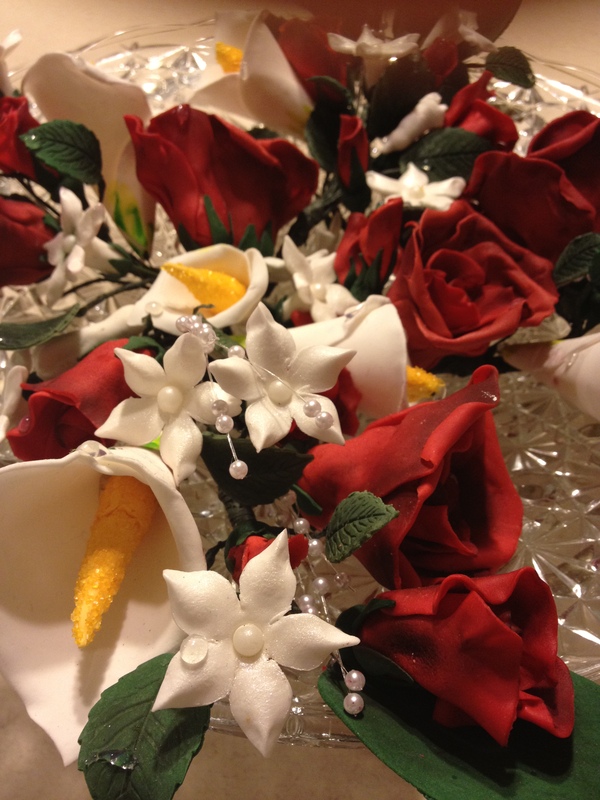 Place the bouquet in the center and carefully gather the cellophane wrap together. Tie a ribbon just enough to loosely hold the bouquet. I usually like to give the bouquet with a few extra cupcakes just incase 1 or 2 fall off the arrangement and can be replaced at the venue. I’ve shared some ideas for lighting up your home this Diwali. The first two photos on the top show the easiest way to go; cover your table with a bright colored table cloth and top with a festive runner / dupatta /stole in complementary colors along the center. You can even use matching gift-wrap paper that is folded down to size as an easy & inexpensive alternative. 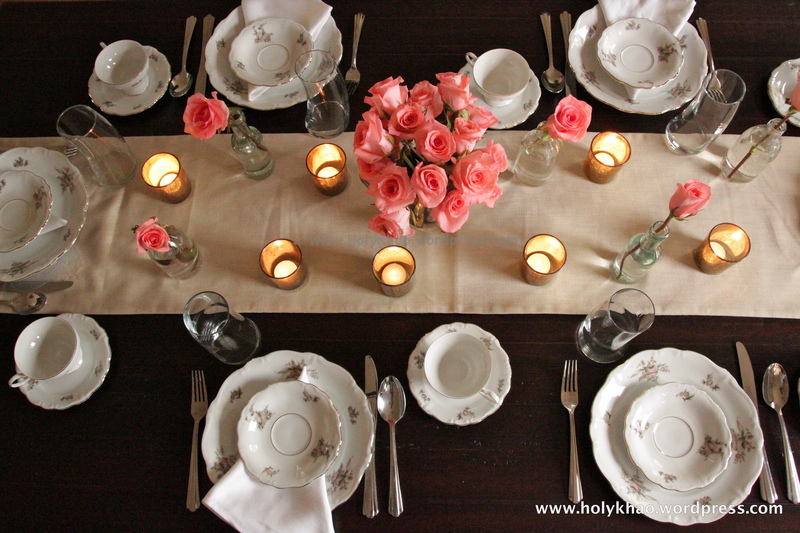 Line the runner with clear votives and use tea lights in them. 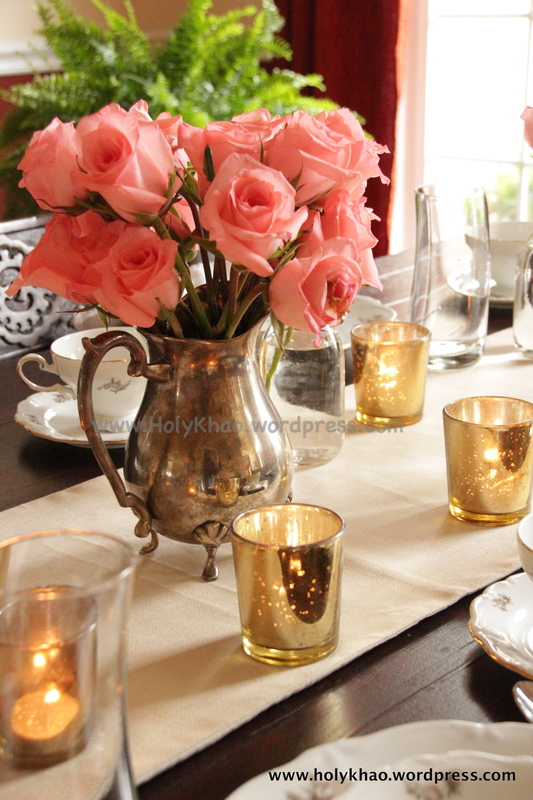 If you want to use decorative votives, use a plain runner. Consider using decorative chargers, mirrors, or silverware to hold your votives. As with any source of fire, be careful and never leave it unattended, especially around children and pets. The remaining four photos have been decorated to mimic henna / mehndi. Henna candles are all over Pinterest and I wanted to give it a try. Problem is, when henna dries, it shrinks and flakes off the smooth candle surface. The easier option was to use brown puffy paint (3D paint) instead. First, the paint adheres well to the candle surface; second, it does not need to be sealed when dry like actual henna. 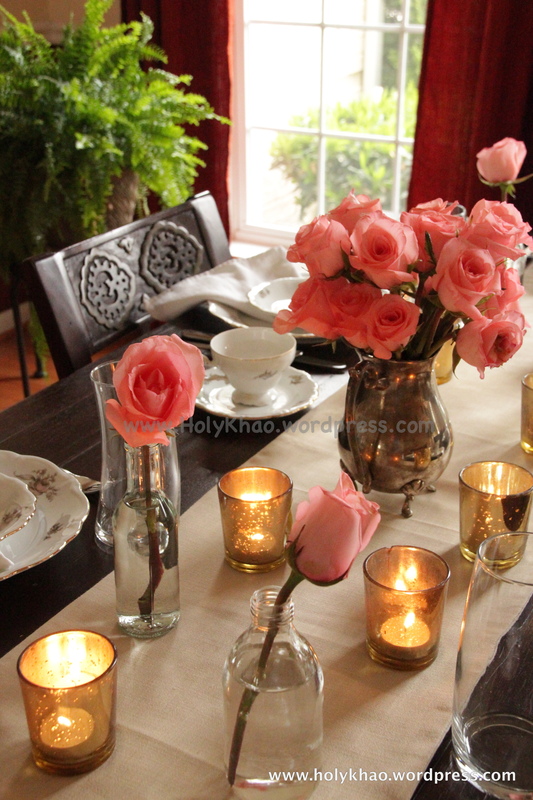 If you are experienced, make the designs freehand directly on the candles. If you are a novice like me, wrap the candle with a piece of blank paper and cut to size. 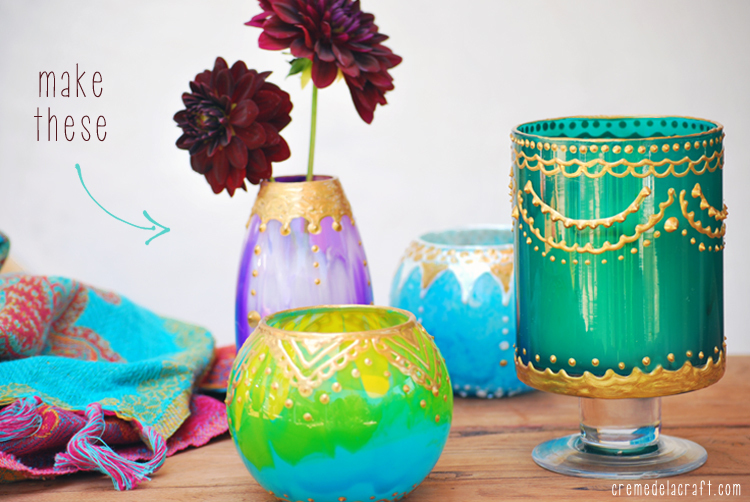 Draw your pattern on it and trace onto the candle with graphite / transfer paper. Trace over the design and allow the paint to dry completely – about 24 hours. Burn the candle for a short while before your party so it forms a well by the wick. This allows the light to show through the candle and give a wonderful glow. (My candles are by no means perfect – I don’t have a steady hand – but the way to perfection is practice, isn’t it 🙂 ) The last candle with the peacock design is battery operated, making it the safest bet. **UPDATE: – Verizon problems, and my Internet connection has been going haywire the past few days. The post that went up yesterday was just an incomplete draft!! Not sure how it got posted. Anyway, here’s the updated version, and I hope the post makes more sense now. I’ve also included links for other interesting ideas on the web. Hope you enjoy them. 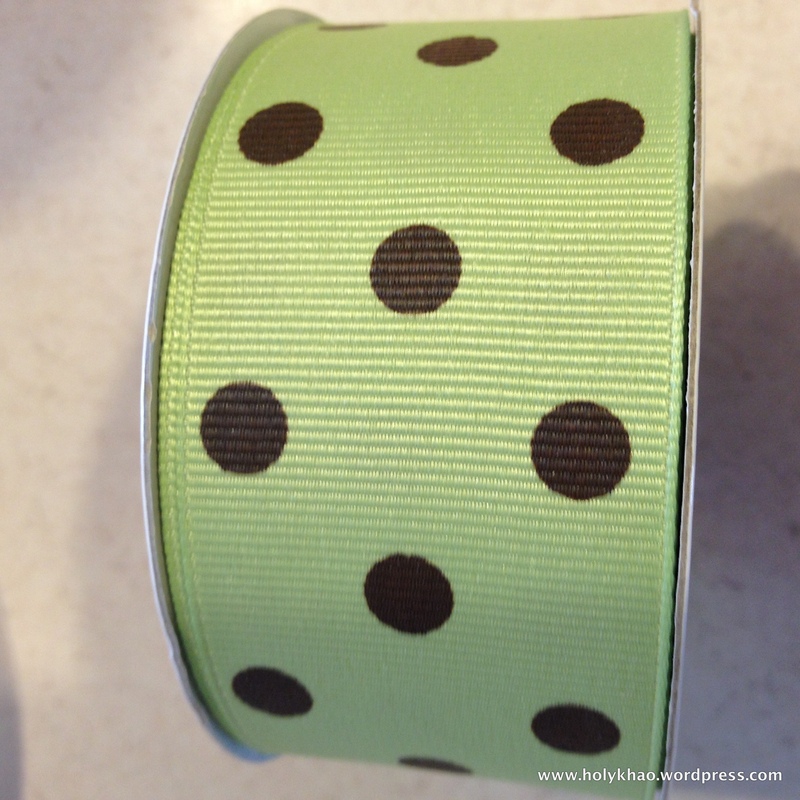 So many ideas – so little time! Lesson learnt – start getting blog entries ready early! Way Early!! 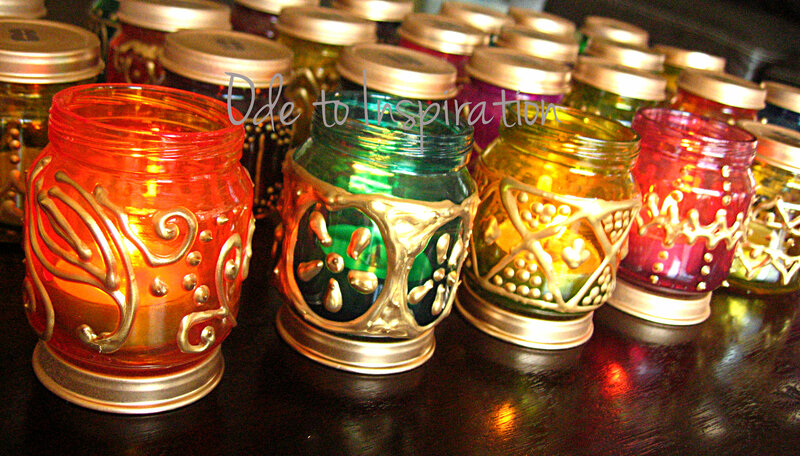 Check out how DECOR IN A SNAP uses beaded cuffs to make pretty and interesting tealight holders.